Professional organizers can be very beneficial to anyone looking to take control of their life. They offer a wide variety of services, from designing a functional closet to organizing a move. For homeowners in Chicago, a professional organizer might plan and reorganize the space of a room, or improve paperwork management. As one of thier main jobs, they will help clients reduce an abundance of clutter and accumulated paper at home. Professional organizers aim to help individuals take control of their surroundings, time, paper, and implement systems for their life. One system that some professional organizers in Chicago use is the “SPACE” technique, which is an acronym for, Sort, Purge, Assign a Home, Containerize and Equalize. This principal is applicable to every type of organization and Redi-Box Moving Boxes can be very handy when you need to containerize your belongings. If you hire a professional organizer in Chicago to help organize your home or your move, we have put together a list of the best professional organizers in Chicago. We all know the homes and apartments we live in require annual maintenance and upkeep. Some maintenance items can be planned for and scheduled, while other items can be emergency and disaster related. We hope you never have an emergency but if you do, there are companies that can help. They are called Damage Restoration companies and can help with you a wide range of problems. If you are handy, you may be able to tackle the job yourself, If not you will need to find a good local damage restoration company. What can a damage restoration companies fix? Water Damage, Flood Damage, Mold, Fire Damage, Storm Damage, Cleaning Services, 24/7 Emergency Restoration, Smoke Damage, Biohazard Waste, Disposal, and other restoration service. We know you don’t want to be in a situation where you need them but if you do need them, we put together a list for you. If you find yourself in a situation that you need to call a damage restoration company, we recommend using our plastic moving boxes to secure any personal items that have not been ruined. See below for some of the best damage restoration companies in chicago for you to hire. Ready to Move? Use Redi-Box! The last time I moved, I collected boxes from the cardboard recycling dumpster outside a Family Dollar store. As I was digging through the dumpster full of cardboard, I thought about how many places all these boxes had probably been and how dirty they were. There must be a better way to move, I thought. It seems I wasn’t the only one thinking that! A new Chicago start-up is providing an alternative to cardboard boxes for moving day. 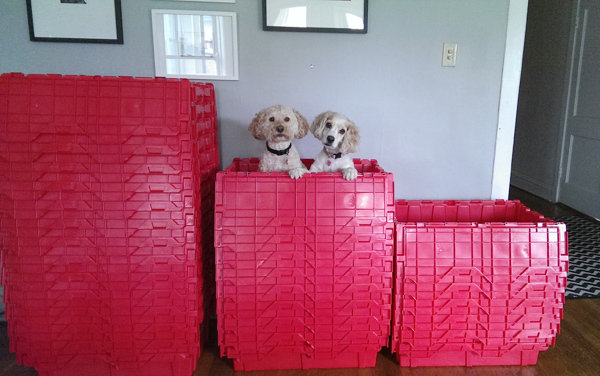 Redi-box rents plastic bins for your packing and moving needs. Although currently only available in the Chicagoland area, I can see this concept growing to a wider market. Renting the boxes from Redi-Box seems fairly easy. First, you estimate how many boxes you think you’ll need to pack up all your belongings. The boxes are approximately 27”w x 17”d x 12.5”h and there’s a guide on the Redi-Box website to help you decide how many boxes you might need based on home size. Once you place the order, Redi-Box will deliver empty, clean plastic boxes to your door. You then use the boxes to pack up your belongings and then move them to your new home. After the move, you unpack like you normally would and then Redi-Box will come to your new home and pick up the empty boxes. There are a couple of great side benefits to using this service. First of all, with the great return of the dreaded bedbug I’m not as willing to dig empty cardboard boxes out of dumpsters. Secondly, knowing that Redi-Box will be back in two weeks to pick up the plastic bins would give you initiative to unpack everything. You’d be far less likely to shove the boxes into the corner after moving day. For more information on Redi-Box, check out their website.